The male at our Harrison Mills nest disappeared partway through the 2017 nesting season (both chicks fledged successfully) – and we’ve been wondering if Mom was going to find a new mate. And the last couple of days, we’ve seen two eagles visit the nest! We’ve seen a band on one, so think it is our “Mom” – and they do seem to be acting like a pair. 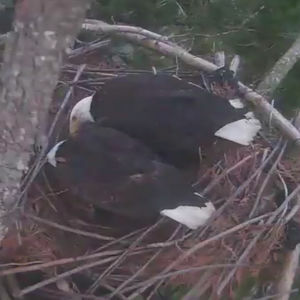 This screenshot from March 12 shows them checking out the nest. We’ve been seeing them mostly at dusk – and Mom generally doesn’t lay eggs until early April, so they have time to get the nest ready. Follow the action on our forum – click here.